Alan Covel began the model tour, with his display on the stage. Most could guess it was Alan’s: at a scale of 1:3, the curious yet familiar yellow shape of the Reliant Regal Van made famous in the TV series, Only Fools And Horses. Alan’s van is 45" long and 16" wide, with its 3 tyres donated by a Mothercare push-chair, and re-mounted on Meccano Hub Discs. Jim Gamble, himself a former Reliant owner, (and not at all like Delboy Trotter!) told us of the special skills required to drive such a vehicle, which only demanded a motorbike licence and modest road tax. Towed behind Alan’s Reliant Regal was a 1954 Cardinal Travel Trailer, a U.S. built caravan. 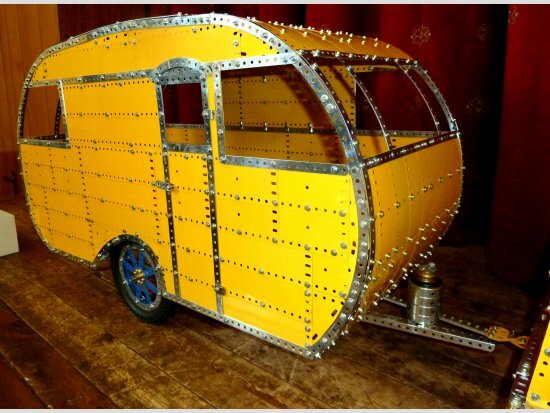 Originally built from aluminium, these petite caravans were reminiscent of the larger Airstream Trailers and could be towed by most cars. Despite appearances, Alan’s model wasn’t quite as small as the Reliant, since the radius of 5 ½" Curved strips used at the front of the bodywork had dictated a scale of 1:4 for the Cardinal. 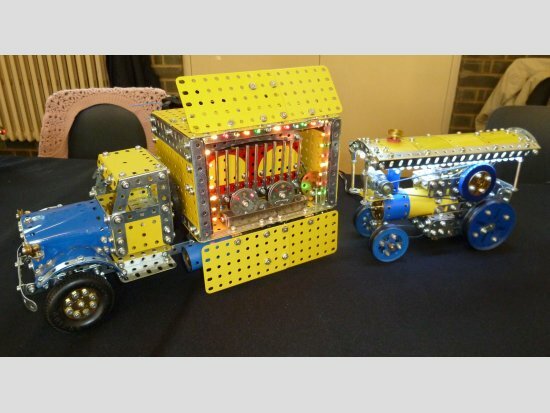 Dave Phillips showed us some more detail of his Showman Engine, caravan and water bowser. The busy valve gear has a very quiet motion. Built into the back wheel is a differential inspired by Bert Love’s book. Excellent tyre treads were provided by ribbed rubber matting taken from a motor scooter. 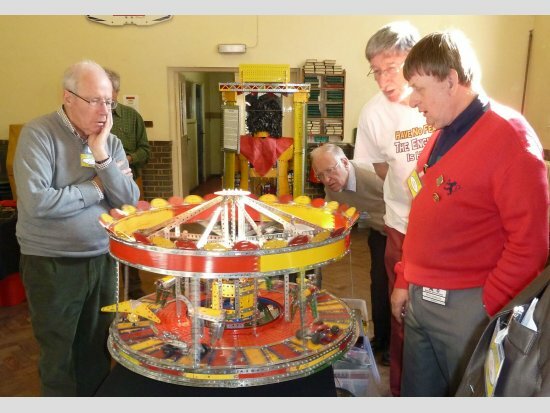 Dennis Backler shared some his Meccano news with us. 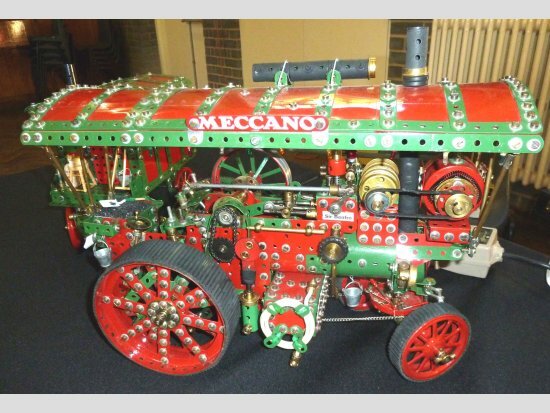 He has been able to convert a large bedroom into a Meccano museum to display his diverse collection. Walls have been fitted out with shelving, and the central area filled with industrial-quality tables. Dennis has added further refinements to the bogies of his Roger West Diesel Multiple Unit. Judder from the Worm drive has been eliminated by the use of a prototypical cushioning method. 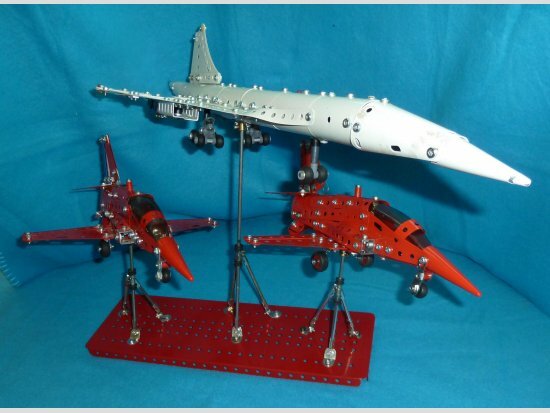 Dennis had brought a display of two Red Arrow Hawk aircraft flying in formation with Concorde. Using Rod Sockets, Dennis had mounted each fuselage on axle rods, each angled to give the display a more exciting impression of speed and grace. 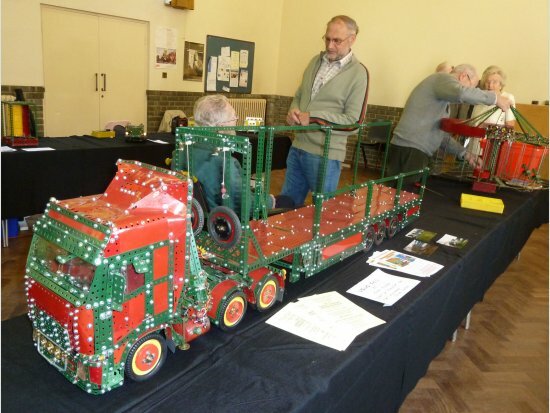 Bob Thompson had brought, the late Chris Beckett’s No.7 Red and Green open-topped early double-decker bus. This freelance design looks especially neat at this scale, since it uses flexible plates from the time before slotted holes were introduced. 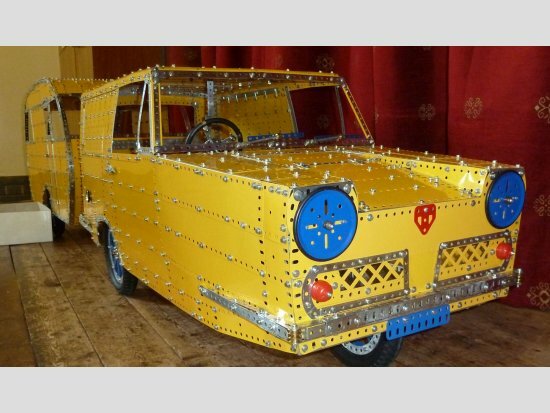 John Palmer is building the March 1956 Meccano Magazine’s ‘Model of the Month’, a Bedford truck car transporter. The tractor unit is now complete. A further vehicle was inspired from the 1950s era No.5 outfit. John has added a breakdown crane to the lorry chassis. 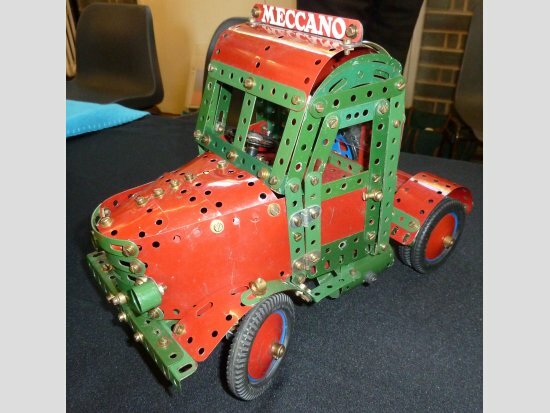 Roger Burton had reproduced a piece of modern-looking green technology featured in a Meccano Magazine from 1943. However, the Finnish engineer Sigurd Savonius first made this Wing Rotor in 1922. Unlike most wind turbines, the axis is vertical. Two curved plates overlap slightly, and a breeze from any direction will turn the rotor. The overlapping arrangement helps improve the efficiency of the turbine, which can also be used underwater for tidal power. John MacDonald demonstrated a new 8 x 4 military lorry chassis. Narrow Girders are used to construct the side members of the chassis. Chunky soft tyres, the sort which fit on the modern plastic geared hubs, add to the realism. The model has 4-wheel steering, a gearbox with 3 forward and 1 reverse gear. The double drive bogies have differentials and suspension. Working headlights have been modelled using ¾" Flanged Wheels with the flange removed. John Sleaford told us more about his range of traction engines. 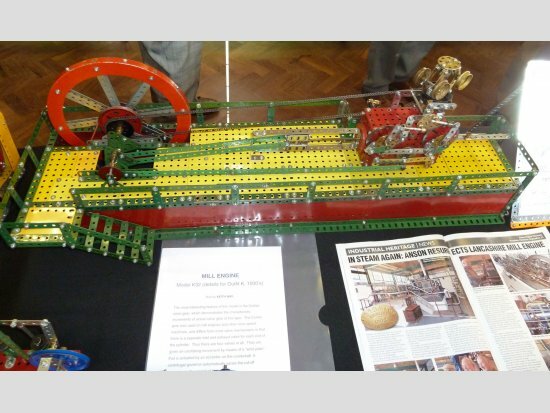 First inspired by a No.5 outfit showman’s engine seen in Constructor Quarterley, John went on to produce seven variants, including a steam roller. Today we saw one of the traction engines and a particularly colourful showman’s engine. John’s son Peter had sourced some bright l.e.d.s which fit neatly into models at this scale. 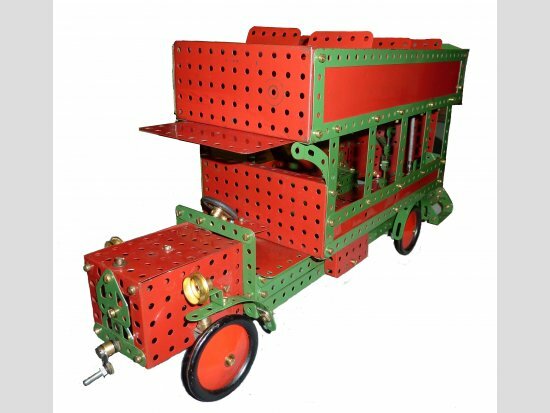 Alongside the traction and showman engines and ‘living wagon’ was a fairground organ mounted on a former topper-lorry chassis. Ken North is busy constructing a large fairground roundabout. 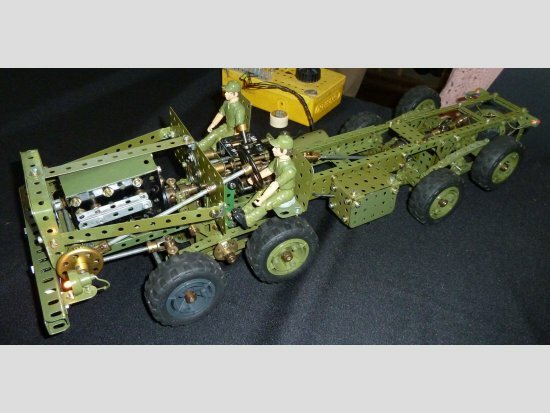 When complete, there will be 24 ‘gallopers’, all modelled in Meccano, using 3"Cylinders. The central drive to the eight tripled Crankshafts is a particularly awkward challenge. Instead of using the geared drives suggested in Bert Love’s book, Ken had used friction drives. Eight 1" Pulleys with tyres are driven from a 6" Circular Plate. In order to improve friction, adjustable springs pull these driving wheels down onto the Circular plates allowing sufficient torque to be transmitted. In addition to the eight galloper shafts, Ken plans to add still more drive shafts to vertically spin waltzer-like cars. Again, a friction drive from the centre is used, this time via a ½" Pulley and tyres. John Molden had brought the Volvo FH12 tractor unit and tri-axle trailer used for transporting sections of his massive ‘Wild Mouse’ roller coaster ride. The Volvo has a working clutch, six-speed and reverse gearbox, together with a working Hi-Ab crane, outrigger stabilisers and winch for the spare wheel. The tipping cab reveals working controls, including a handbrake to the prop shaft. 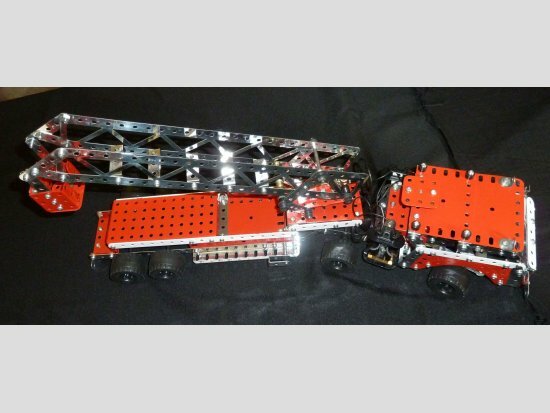 Giles Smith had used a recently acquired 1994 Master Builder set 7064 to construct its signature model, an articulated cherry-picker fire rescue platform. Next to this was a smaller fire truck driven by a 3V motor. 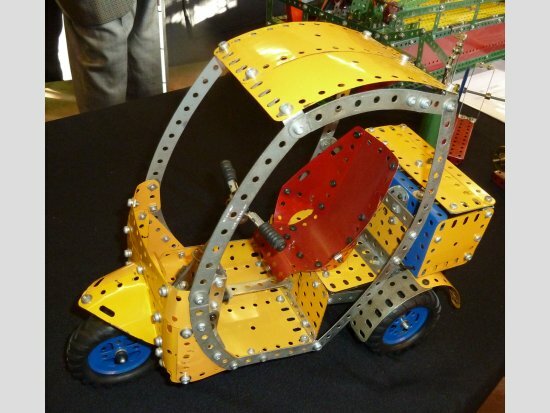 Giles also had a range of Meccano outfits for sale. Christopher Bond was unable to attend the meeting, but Tony Wakefield kindly demonstrated his models. There was a fascinating reproduction of the Rolls Royce ‘Flying Bedstead’ experimental craft from 1953. The prototype was the first aircraft to fly using jet engine thrust rather than aerofoil wing surfaces. The research, done on a special gantry rig at Hucknall, Nottinghamshire, paved the way for future vertical take off and landing (VTOL) aircraft like the Harrier jump jet. Christopher had also modelled various ancillary ground-crew equipment, including battery-charging apparatus, fuel tanker and steps. 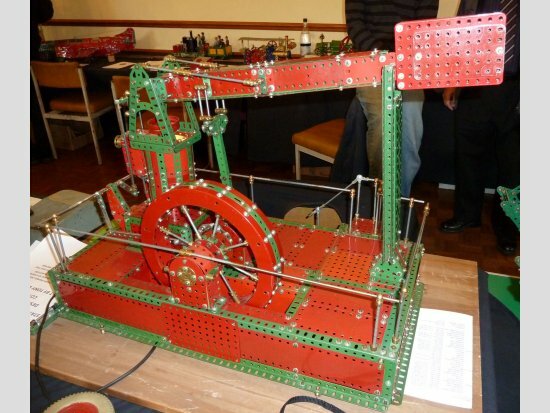 Tony Wakefield went on to show his version of the Grasshopper steam engine designed by Mike Cotterill. The prototype was one of a number of successful attempts to circumvent James Watt’s patented parallel motion beam engine. Instead of a fixed pillar supporting a rocking beam, an oscillating pillar supports the beam. 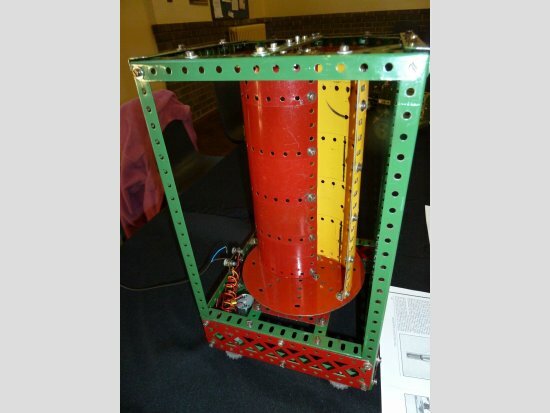 Tony had been able to improve the performance of his model by the addition of a counterweight to the beam, thereby lightening the load on the flywheel considerably. Jim Gamble’s display had been prompted partly by an enquiry from Bob Thompson about Digger Buckets being produced in blue. Contrary to popular belief, these items came not from the Blue-Gold period (1935-40) but from an earlier Red-Green period. Between 1932 and 1934, Red-Green outfits (a shade similar to post-war Red-Green) had their wheels, including Sprocket Wheels, finished in blue. Jim showed a fine re-strung 00 Outfit from this period, complete with blue Pulley wheels. From the same period, there were fine examples of the cardboard parts introduced to enhance models. 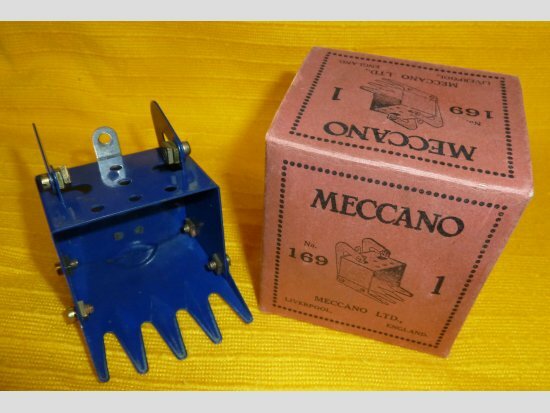 It seems odd that recent Meccano sets have not used this idea to beef-up smaller outfits at very little cost. Dave Bradley revealed his own design, a ‘concept car’ based on a motor tricycle. Like the Reliant 3-wheelers, there is a real financial incentive to miniaturise cars. Dave’s vehicle would be small enough to be exempt from congestion charging in London, yet the driver remains enclosed from the elements, dressed in his smart city clothes. Steering is achieved with handlebars causing the front forks to tilt. This could be more comfortable than a Reliant and safer at speed in busy traffic. Dave is also working on a 7.5 ton lorry cab, presently at an early stage. Keith Way had completed the Outfit K Mill Engine (No.32). The model is ideal for demonstrating the Corliss valve gear, a system frequently used on slow engines. Separate inlet and exhaust valves are provided at each end of the horizontal cylinder, four in all. Above the cylinder, a centrifugal governor regulates the valves automatically, according to the speed of the engine. This American design, patented in 1849, allowed steam to enter the cylinder without great loss of pressure. Cold exhaust steam can exit away from the inlet valve, reducing any cooling effect on the rest of the engine. Horizontal engines were ideal for adding to existing water-powered mills where headroom was limited to that required for looms and their drive shafts. 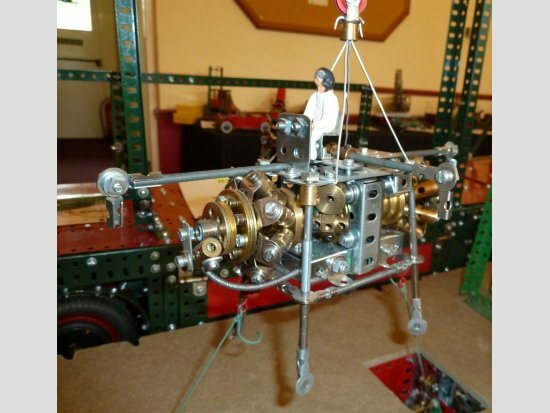 Keith had also produced a smaller horizontal engine and a beam engine, each from only 30 parts. All this engine-building activity is leading towards the Meccanuity Exhibition 4-7 May 2012, where Keith is co-ordinating the special project theme: Static Steam Engines. Paul Hubbard’s roundabout is progressing. Twenty-four Flanged Sector Plates are used to form the platform, which is further extended by flat plates and strips, to 28" diameter. Many 12 ½" Strips and 5 ½" x 1 ½" Flexible Plates have been used to make up the rounding boards. On the top frame, a 4" Circular Plate forms the central fixing for radiating Angle Girders and strips. 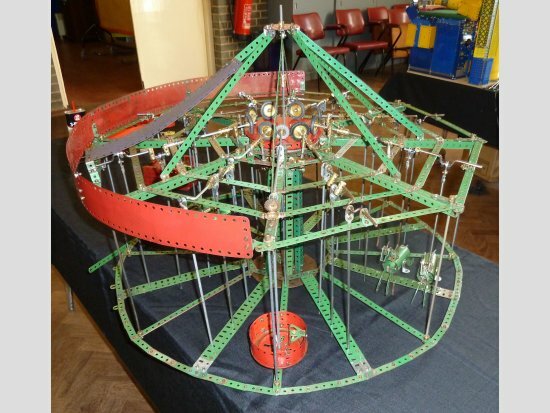 Paul’s Ferris Wheel has been dismantled, providing a powerful motor to drive the roundabout via a chain reduction and gearbox. 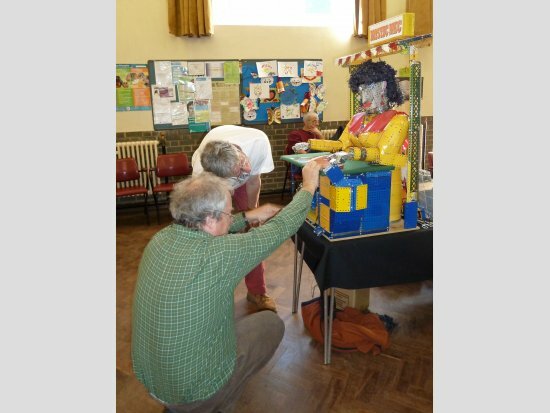 Chris Shute demonstrated his Mystic Mec fortune-telling automaton. The life-size lady has working eyelids, head tilt and turning movements before she strokes her index finger over a client’s palm. Having read the palm, Mystic Mec proceeds to choose a letter with her left index finger to offer a clue to the future. Previously, the choice of letter was ‘fixed’ by Meccano infra-red remote control from her master’s trouser pocket. Since June, a ‘pseudo-random’ letter selection system has been operating. The stopping position ofthe letter-pointing finger is dictated by a Rack and Pinion motion sliding below a 32 sided drum. Various projections from the drum, corresponding to the letters of the alphabet, cause the Rack/Left arm to stop. After each performance, the drum is advanced to a new position, by increments of 1, 6 or 7 letters. Using this method, it is difficult to predict which letter will be chosen next. Normally a sequence of 48 letters, would be drawn before repeating, well over an hour later.